Will the foreign investor buy the Italian company? NOTE: this horary has first been published in the IAM, Infinity Astrological Magazine. My client had been commissioned to find an investor for a Wine company. As usual in Italy, the contract between my client and the seller was on a “non-exclusive” basis, which meant that the seller could also find an investor by himself. Nevertheless, my client had contacted a holding in Dubai, which was extremely interested in the investment opportunity. 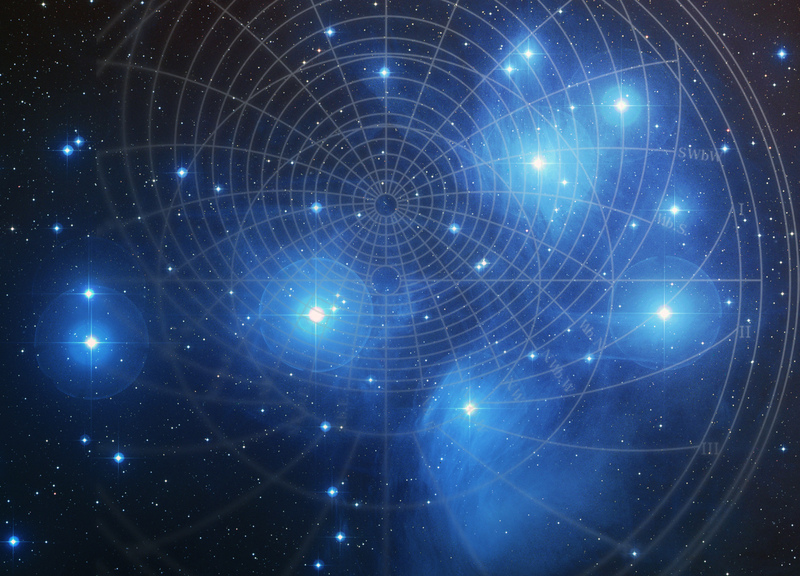 The querent is described by the AC in Virgo and its ruler Mercury. The planet is in the 5th house, associated with games and leisure. Part of the deal was a golf course, particularly dear to my querent. Mercury is in his triplicity and own terms, but retrograde and compost. The querent is thus described as honest but not sufficiently influential, or to some extent weakened by the Sun. The Sun generally describes influential people or authorities. In this chart, he rules the 12th house of hidden matters. The sign the Sun is in (Aquarius) is known as “human”. We can thus presume, that the Sun shows a hostile person, but whose hostility might not have been noticed so far. The estate is described by the 4th house in Sagittarius and its ruler Jupiter. Jupiter is in the 12th house, the place of enemies and he is retrograde. The planet is essentially strong, but accidentally debilitated by his position: The estate was very large and had a famous history (Jupiter in Leo), but had fallen into decay in the last 20 years (Jupiter in the 12th). Saturn is in the 4th house, which describes the property to be old and/or badly administered. The seller is described by the 10th house and its ruler Mercury, who already describes the querent. This is why we have to look for the natural significator of power, which is the Sun, also dispositor of Jupiter, the 4th house ruler. 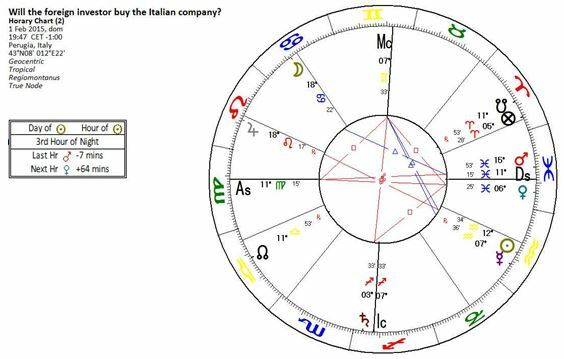 The Sun (seller) is in opposition to Jupiter (buyer). This signifies that it is the seller himself, who opposes (or works against) the deal: The Sun is in a difficult position by being in his detriment and in a cadent house. If we use the second house from Leo to see the seller’s finances, we find them described by Mercury combust. The seller needs money. The Moon is VOC, there is no applying aspect to any other planet. This is a strong indication that nothing will happen regarding the foreign investor. I told my client that I did not believe the deal was going to happen. The foreign investor was really interested in buying the estate. He only asked for a little more time in order to work through the papers. Unfortunately, he had lost much time at the beginning (Jupiter retrograde). In the meantime, the seller had started negotiations with a third party my which client did not know about. In the horary, Mercury is retrograde, thus his combustion did not immediately place, but only on April 9th, 2015 when both planets are in Aries in the 8th house. On that very day, my client was put aside (still without being informed). I suppose this was not the day the estate was sold to the third party, but the moment the seller and the buyer found an agreement. When the foreign investor came to Italy, that deal was already sealed and the die was cast. The seller just did not inform the querent in order to avoid discussions. The querent discovered that the estate had been sold to a third party on July 21st, 2015 (only few days after the foreign investor’s visit). Mercury is combust in exact trine to Saturn, retrograde in the 3rd. Saturn is the malefic out of sect. The 3rd house is the 4th from the 12th (seller). From the seller’s point of view, the transaction was successful (trine). The querent, in the meantime had entered combustion and lost the deal. He is not the seller but an intermediary. The selling object was a company, whose main property was the land the company owned and cultivated, so I use the 4th house to describe the property. 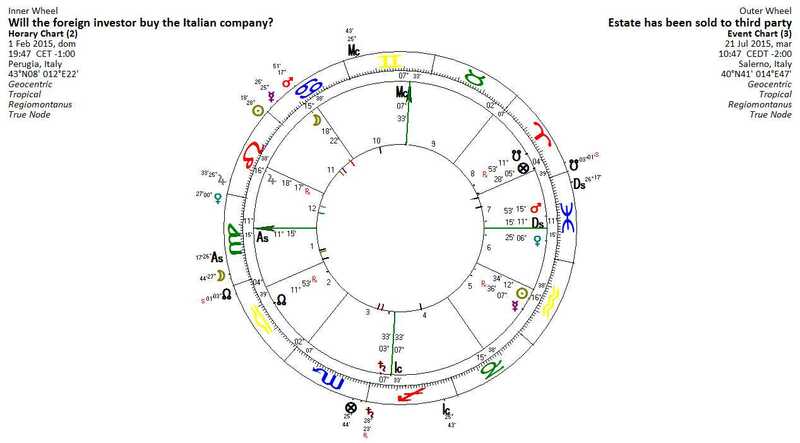 In horary, the Moon is the co-significator of the quesited (in this case the investment deal). The Moon is the fastest planet and thus associated with travel and exchange. Usually, in this kind of charts, the seller is described by the 1st house or the 7th house, depending on wether the querent buys or sells. In this chart, he has a secondary role as he is not directly involved and I use his significator only to gain more comprehension of what is going on. © 2010 Tania Daniels, Astrologer. All Rights Reserved.